The Rainbow Vomiting Pandas Of Interestingness were starving. It was time to eat. Ling Ling grazed on her usual fare, flowers and sunsets. She found some kittens at sunset that tasted like lemons and butterflies. Hsing Hsing started on her latest interest, winter wonderlands and airplanes floating on the Hudson. But it would soon be St Patrick’s Day, and Hsing Hsing was already tasting the emerald tang of shamrocks and green beer. Wang Wang explored Eastern Europe, and settled this day on Poland. The churches and streets were also very filling. A river of light for desert. Finally, they were fed, stuffed and ready to burst. The three as one escaped to the sky, able to hold it all in no longer. And like the day before and the day next, they burst. Inspired by the work of Rev Dan Catt. 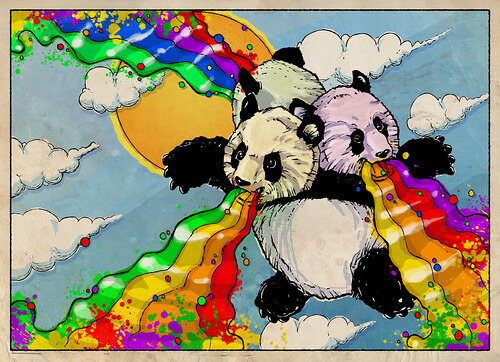 via The Rainbow Vomiting Pandas Of Interestingness on Flickr – Photo Sharing!.